Roger!!! How nice to see you again! He ain't kidding! He can draw and most of all his comic rocks!! galactica1981, I have read the first issue and I must say that I like the general idea behind your work: it all feels like a storyboard for a movie. The subsequent images flow and the whole "construction" allows for some pretty neat tricks with the "camera" or cuts". Also, the dialogue is pretty good and you have a great knacj for facial expressions. Having said that ;) let me explain what bothered me most. The default M4. Everywhere. I mean, you use really splendind facial expressions, conveying emotions like a pro - and still you use the same M4 morph that came out of the box. For your main character! With this I don't know if Max is supposed to be handsome or just plain cocky, all I see is the default M4. The lighting / postwork issue has been discussed ad nauseam in the thread so I won't be talking long about that (it does bother me, but not as much as the lack of personality in M4). I know it can be really difficult and timeconsuming to postwork EVERy SINGLE panel ;) I have been there. On the other hand, sometimes little postwork goes a long way. Just to show I'm not all talk, some pages from some of my graphic novels (newish and oldish... ;)) Yes, it's postwork galore. Just a note for galatica1981 and others who did the download and then found that the CBZ format wasn't supported by your system.. The Comic is stored in the CBZ format. However, it's a series of full page JPGS. To read the story easily you don't need PDFlite or anything special. Everyone should be able to do this. 2) Make a folder for it. 3) Unzip the contents to the newly made folder. Any unzipper will do. I use Winrar. 4) Open the folder with your favorite graphic viewer and enjoy this young man's offering. I used the Windows slide show to read his story. It's exactly as he stated above. Rather PG-13 in rating. I am impressed with the choreography of this scene (picture below)! and the effects ... These complete the scene in a way that the reader of comic books hold your attention!!! you could mention what tools used to produce these effects? it would be of great help here. The zoom lines were made on two layers: one layer is a spcial brush designed to make speed lines. ( good tutorial can be found here: http://katycoope.blogspot.com/2008/05/creating-speedlines-on-photoshop-part-1.html). The second layer is the render with background and the radial blur filter (set to zoom). All things combined, on seperate laters, give the desirable effect ;) I find reading battle manga really inspiring when it comes to scripting fight scenes. Naturally, the mangas have different pace, people freeze mid-action and talk how they would use this and that attack, but the action frames can be really helpfull. I hope this description will be at least a bit of help. Nooooo!! This is a great help! enough is enough!! You Nobre. Thanks for sharing your method with the community here. Sorry I haven't been in touch for awhile. I've been working hard on a side project, a single issue comic book of Buffy The Vampire Slayer (which happens to be my favorite TV show of all time). 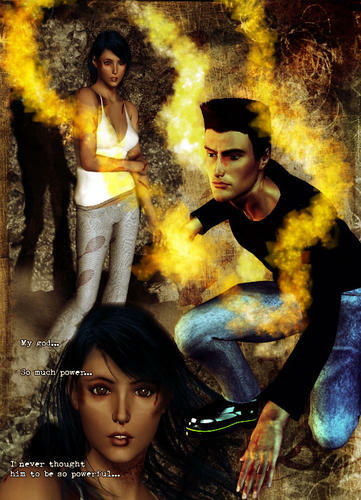 In fact, doing a Buffy comic was my main inspiration for taking up 3D digital art. The comic is about two-thirds of the way done. Regarding lighting, I recently realized that many of the sets I've bought have their own light sets. I've been using the light set from a product called Easy Environments: Top of the World. I've been using this light set in a lot of my renders, and I like the results. I haven't had the chance to experiment with it for Max Rogers, though I will eventually. 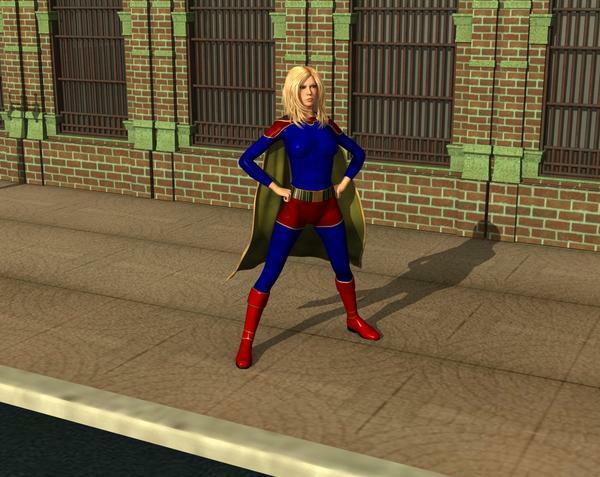 Here are a few sample renders from my Buffy comic book. I think you'll agree the lighting looks pretty good! I think your issue with the M4 default model is mostly due to being a DAZ artist. I don't think a non-DAZ reader is going to notice. 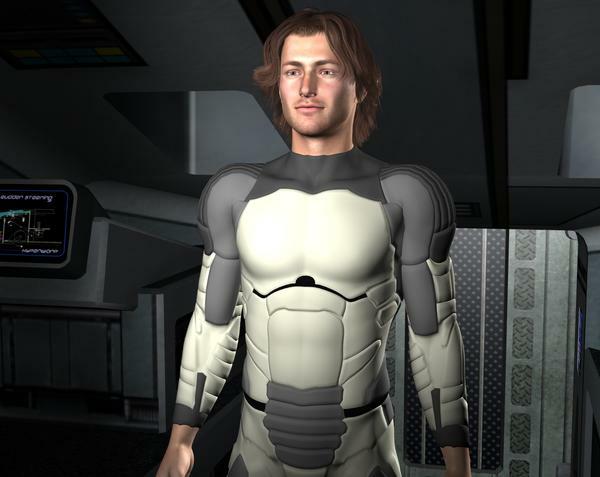 That said, in the beginning, I was never totally happy with using this model for Max, but I couldn't really find anything else. However, with time that has changed, and now I'm quite happy with it. I think the same might happen for you if you were to keep reading the comic. But I appreciate your kind words. As a guy who is not a professional artist or a writer, I think I've made a pretty good comic overall, and I personally am very happy with it. This was a story idea I had going back six years, so it really was a dream come true to finally bring it to life. This is one of the reasons why I can't bring myself to get mad at DAZ like so many other people. I just feel really grateful to DAZ for providing the tools to make this project possible. 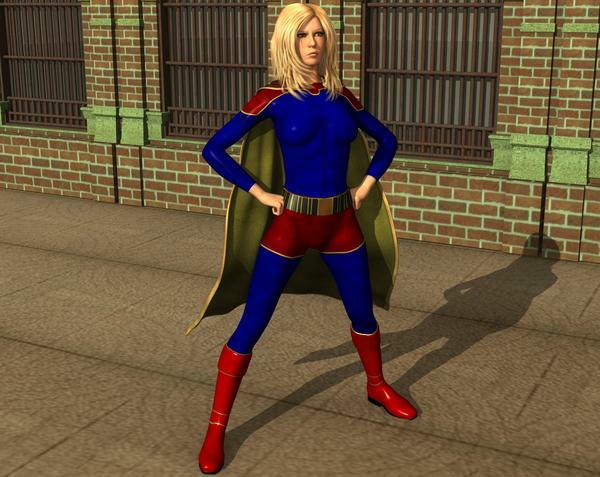 I don´t think Buffy ever wore such outfit. ;-P But your pictures look great! I like picture 3 (nice shadow and pose/expression) and 4 (cool scene) best. 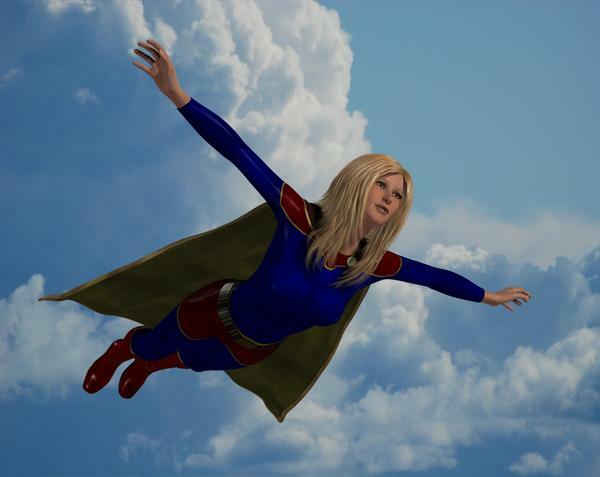 This comic is going to be an untold tale from Season 8 (which took place as a comic book series from Dark Horse comics). 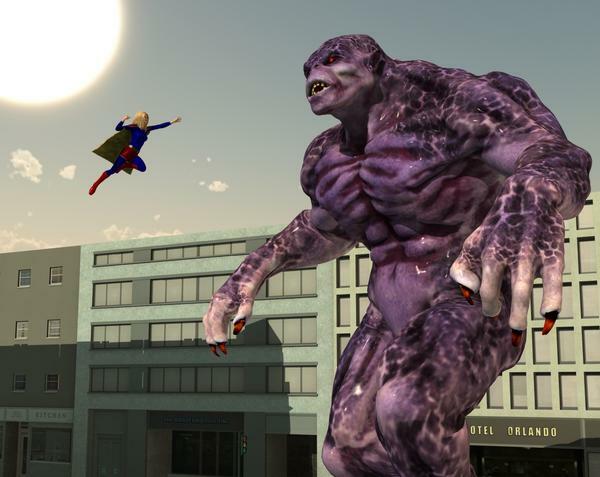 During Season 8, Buffy briefly acquired Superman-like powers such as the ability to fly. HMMM! I like picture 3 and 4. Here is another version of one of them. 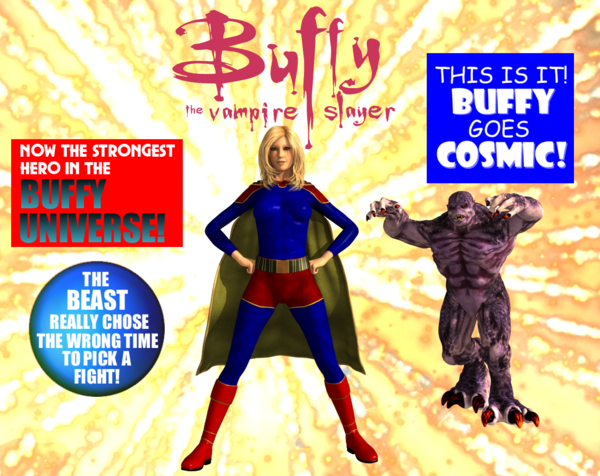 In the Buffy comic, I've been using the Genesis model by itself for the first time, and I'm amazed at how faster it is to save and load files. I still prefer V4 and M4 overall (mostly because there's so many more expressions products available), but the quick load times have been sweet! Thanks for this info. I plan to make it available on my website. Hmmm... PG-13? I was shooting for PG! 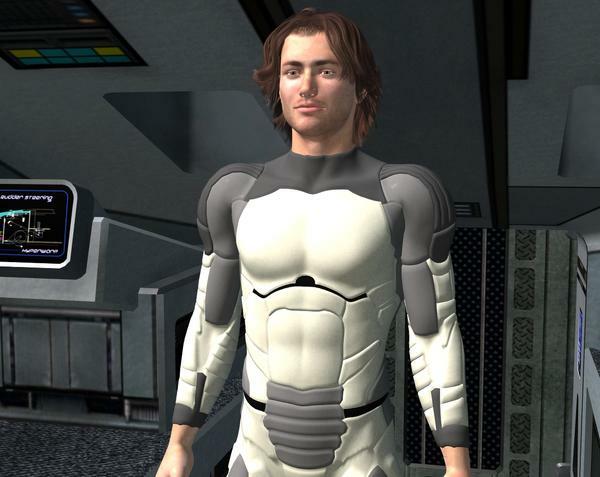 galactica, I just got a chance to look at some of your comic. I like it. Many of the critiques were valid about lighting and so forth, but you tell a good story. i think you're on to something with the one panel at a time layout. It's effective for the computer, and even gives an animation-type effect when moving from one panel to the next. Some have said that having every panel the same size affects the pacing, but I disagree. As I was scrolling through, I automatically flip faster through some panels, and slow down for others, depending on how much there is to read, what sort of action is going on, etc. I'll add my own constructive critisicm, however. Often you have tails of your word balloons crossing each other. This is viewed as a "no-no" by many comic book professionals. You can usually change the view or move the tails to avoid this. Check out blambot.com for a few tutorials on speech balloon creation, it's very helpful. Otherwise, keep up the good work. Doing is the best way of learning. I've created a new version of cover #5 using the light set for Easy Environments: Top of the World. I'm curious what people think about it. With this picture, the Raytracing is off. I tried it with Raytracing on and did not like the result at all. One caution about using light sets that come with products is that sometimes they are Poser sets with no DAZ Studio equivalents. DS will load Poser light sets, but I've never been happy with how they look. "Top of the World" does include DS-specific light sets. However, the lighting is designed for a scene that is outdoors at high altitude with no sources of shadow. This makes it rather bright and low-contrast for an indoor scene, even one in a brightly lit interior with white walls. I've been experimenting with lighting a lot lately, and here is an image that I like a lot. I've purchased a Dreamlight course called 3D Time Saver so hopefully I can find a way to reduce the time it takes to make these renders. Otherwise, it just isn't going to work. Personally, I think the lighting still looks a little too flat. There's minimal shadowing and the light has no defined direction, seemingly coming in from everywhere at once and in equal quantity. As I said before, it seems to me you're still trying to recreate the 'headlamp' style lighting which Daz creates by default, possibly because you're too used to seeing your images done like that. The problem with that is that you're missing out on the whole reason for using lighting in the first place, which is to add depth to an image. It's important to think where the light would be coming from if it was a real image and position the lights appropriately to mimic that effect. You don't need to aim for photorealism, but even subtle things like shadow positions can be very distracting if it looks wrong for the scene. It is very possible to get good results quickly with certain lighting setups, but it will take practice to get right. Once you learn which lights eat up the render time, you can minimize them while maximizing the effect overall. No bodys perfect at this from the start .Ya doing good for a newbie. Most newbies just follow the 3 light rule . I think it goes 2 lights in the back one in the front. All the shaders are matt. I hate to pop in but galactica1981 all these things the others are saying can help. I'm a failed Comic Artist myself the reason I failed was my scripting and the Render times needed for the style I had chosen. I'm going to Upgrade the PC and I have a editor lined up. I will then get back to my comic work. 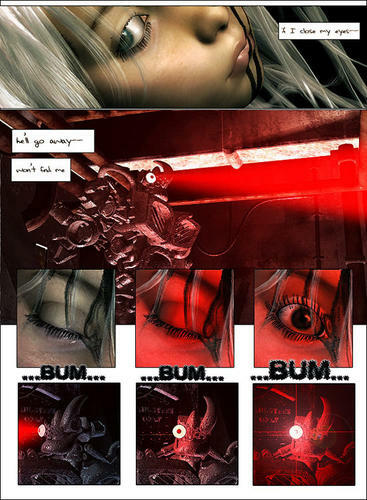 Here is an example of Action and Lighting all used to focus the reader and imply more than is really there. I tried that 3 point Light System using the free Dreamlight Great Art Now Lighting video and here's what I came up with. I really like this one the best! I like this one better than the previous one. Yep, that's way more appealing aesthetically! Nice work! Life is a process of learning. Your newest art will generally be better than what you were doing last month or last year... that's worth celebrating! :) I'm really impressed that you've decided to work seriously on this with a high-quality tutorial series. (Disclaimer: I have no financial relationship whatsoever with DL.) I think you will find that the effort really pays off. You may not end up going with exactly what the "experts" tell you, but you'll develop your own unique style along the way. Have fun! Thanks. After thinking it over, I realized that the art in my comics could be a lot better, and I appreciate the constructive feedback that everyone has given me. I've been experimenting, but I'm really not sure how to use the 7 point system when you have multiple characters in a scene. 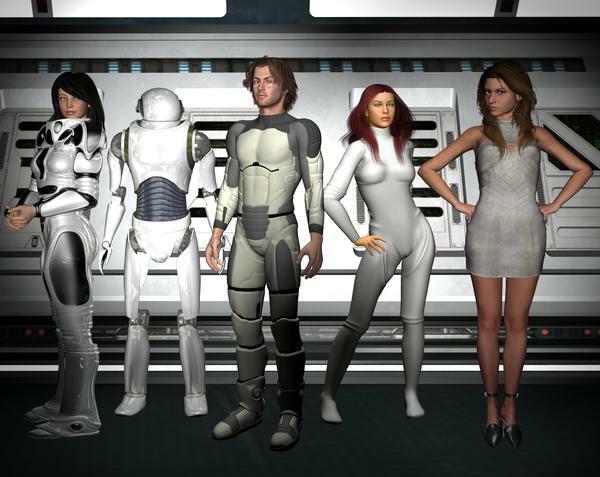 Take the cast photo for my comic, for example. One thing I'm not clear on is the Bounce Light. Should it be aimed at the characters legs or their chests? There are no back lights for this because I just didn't like the way they looked. I'm glad you've figured out how to get improved results without waiting an hour and a half per render! I've worked on both a manga project and a card game, and in both of those projects I could never have waited so long for a single image to render. Keep in mind that some "lighting systems" are designed for particular purposes. I'm not familiar with the 7-point system you're using, but it might be optimized for single-character portraits. That's ok, but it means you may need to think through a bit how to adapt to your context. Portrait lighting is different from "realistic" lighting. It's designed to bring out the maximum detail of a figure and highlight features to emphasize them, and create a particular mood. You are doing illustration, in which you want your lighting to help contribute to the story you are telling. So you don't have to stick with any particular lighting "system," but you do have to think through a bit more what effects you want from your lighting. I think it would probably help to look at some stills from TV science fiction shows that you particularly like, since that's the kind of style you're going for. Note where the lighting is coming from in the scene, including individual focus scenes and larger ensemble shots. Usually the lighting in the whole scene (and the camera work) will be designed for the set, more than focused on a particular character, except when the Beautiful Girl Alien walks onto the deck or something.